Register today with full payment by check or credit card. There is a $75 cancellation fee if student cancels prior than 3 weeks of the start of class. ​If student cancels less than 3 weeks prior to the start of class, there is no refund. Students can apply funds to another class within one year. Students are encouraged to dress casually, jeans are welcome, layered tops are recommended during cooler season and comfortable closed-toe shoes are a must! All tools, materials and supplies are provided for hands-on instruction. If you bring your own tools, they must me clearly marked with your name. Students will have 1/2 hour for lunch. There is a full kitchen on-site, you may elect to bring your lunch, order in, or go to a nearby restaurant. Students are responsible for making their own lodging reservations. 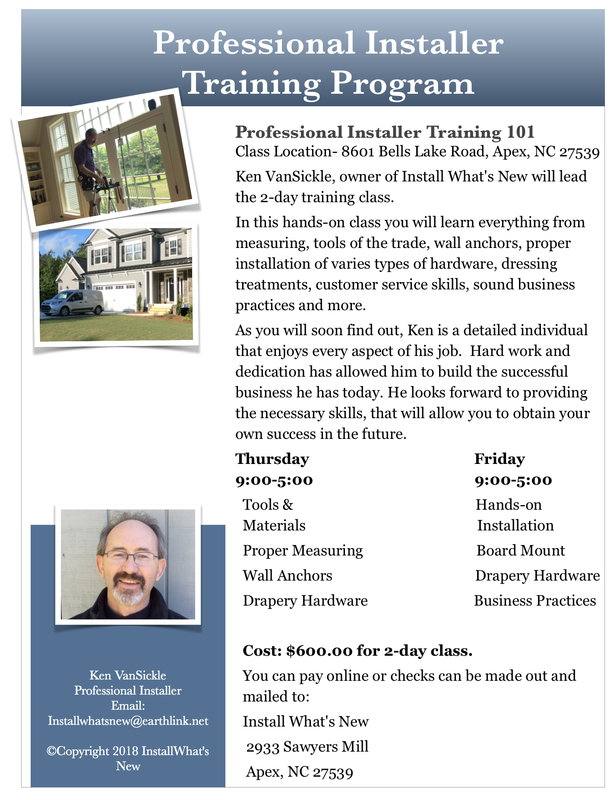 Install What's New is located at 8601 Bells Lake Road, Apex, NC 27539. We are just 27 minutes from the RDU Airport and close to the 95 corridor. There are numerous hotels and motels in the Cary and Fuquay-Varina area. Please reach out to us with any questions regarding lodging. Students are responsible for their own transportation to and from class. Please reach out to us with any questions. Fill out the following form and hit "Submit" to take you to the payment page.